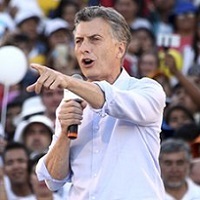 Macri has been particularly criticized for his indirect ties to the last military dictatorship in Argentina in the late 1970s and early 1980s that cracked down on left-wing activists and political opposition. While many of Macri’s powerful economic backers and corporate allies propped up the dictatorship that benefited them economically, Macri’s closest ties to the dictatorship are through his own family business Macri Society, known as Socma. Macri, a long-time business magnate and former mayor of Buenos Aires, has been a director of his father’s Socma corporate conglomerate since a young age. The Macris are one of Argentina’s wealthiest families, and Socma was among the companies that directly benefited from the dictatorship. In 1973, prior to the 1976 military coup that ousted the civilian Peronist government of President Maria Estela de Peron and installed a dictatorship, Socma owned seven companies. When the dictatorship ended 10 years later, in 1983, the Socma corporate empire had expanded to 46 companies. Among Socma’s dozens of companies were various businesses that benefited the Macri family economically by providing services to the dictatorship regime, such as the solid waste management company Manliba, privatized under the dictatorship in 1979, and the postal company Correo Argentino, later nationalized in 2003 under former President Nestor Kirchner. 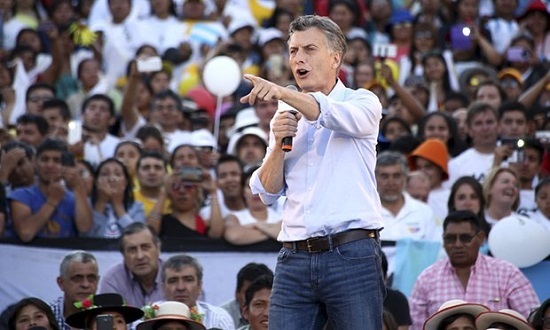 Macri also showed his sympathies for corporate complicity in dictatorship-era abuses earlier this year when he and his party opposed a government move to end impunity for dictatorship supporters. Argentina’s Parliament decided in September to launch an investigation into how people and businesses participated in crimes committed by the 1976-1983 dictatorship. While the vote passed by a wide margin of 170-14, Macri and his Republican Proposal Party made up the minority of lawmakers opposing the bill. The U.S.-backed Dirty War disappeared between 7,000 and 30,000 people in Argentina under the dictatorship regime. Argentina’s right-wing newspaper La Nacion, which supported the dictatorship, hailed Macri’s election as signalling an end to “revenge” for the dictatorship years. “The desire for revenge should be buried once and for all,” a La Nacion editorial said on Monday following Macri’s victory. The editorial referred the end to a “culture of revenge” under the governments of Nestor Kirchner and Cristina Fernandez in reference to their efforts to seek truth and justice for dictatorship-era crimes, including Kirchner’s 2003 repeal of amnesty laws for crimes against humanity. Macri’s election marks the first victory for the country’s right-wing business elite through electoral means rather than military coup. He will be the third non-Peronist head of state since the more than three decades since the end of the dictatorship. While corporate elites and dictatorship-supporters celebrate Macri’s election in Argentina, right-wing organizations across Latin America also welcome his victory as a win for their neoliberal political project in the region. Macri has already made his foreign policy plans clear, vowing to reshape international ties to strengthen relations with the United States and European Union while requesting that Venezuela be suspended from the South American regional bloc Mercosur. Macri’s relationship with the United States has been demonstrated in leaked diplomatic cables, published by WikiLeaks, in which he accused the U.S. of being “too soft” on the Kirchner governments and called on the U.S. to crack down on Cristina Fernandez de Kirchner. Macri’s stance against the Venezuelan government was also clearly solidified when Lilian Tintori, wife of Venezuelan opposition leader Leopoldo Lopez, took to the stage with Macri during his victory celebration on Sunday night. Tintori hailed Macri’s win as the start of “political change in Latin America and Venezuela’s opposition was “delighted” by Macri’s win, Reuters reported. Many of Macri’s supporters are those who hope to reinvigorate neoliberal free trade politics in Latin America and roll back the regional integration projected launched by former Venezuelan President Hugo Chavez. For example, the Argentine think tank Thinking Foundation, focused on developing projects and strategies to get Macri’s party elected, has collaborated with the Spanish FAES Foundation, which promotes neoliberal politics and has strong ties to Spain’s conservative People’s Party. The Thinking Foundation is also part of the Atlas Foundation, which in turn is part of the global Atlas Network, a think tank that promotes neoliberal free trade and market-based public policy through over 400 member think tanks worldwide. Macri’s plans to shift Argentina to the right may still face resistance. The president-elect will be forced to govern without majority support from Congress. In the Argentine Senate and House of Representatives, the majority of lawmakers are not representatives of Macri’s Let’s Change coalition, but of the pro-Kirchner alliance Front for Victory that backed Daniel Scioli’s bid for president. Of 257 seats in the Lower House, 114 are held by the Front for Victory. In the Senate, 42 of 72 senators are Front for Victory officials. The era of “Kirchnerismo” under Cristina Fernandez and Nestor Kirchner may have come to an end with Macri’s election, but the Peronist movement that has long fought for social justice in Argentina now forms the official opposition. While change under Macri is certain, the question that remains is what the long-term legacy of the Peronist movement and Kirchner governments will be in Argentina and Latin America.